It was simply an overnight stop en route to the ferry port at Hertshals. We had spent the previous night at a Holiday Inn near Bremen Airport. The location, opposite a runway and a building site, was hardly salubrious, but it was just a one night stand after all. So, I had no expectations of Aarhus, and as we drove through the busy port area, I had already started teasing the One & Only about his odd accommodation choices. I spoke too soon. Our modern hotel, the Cabinn (quite literally – we had bunks) overlooked a leafy city square hemmed with cafés and bars. The centrepiece was a beautiful red brick cathedral. Saint Clement’s – as in ‘oranges and lemons say the bells of Saint Clements’ – was dedicated to the bishop of Rome, a Christian martyr who was drowned in the Black Sea with an anchor tied to his neck. Thus, he became the patron saint of sailors. Much enlarged over the centuries, the cathedral has a magnificent altarpiece and simple frescoes from the 14th – 16th centuries that have recently been restored. There is also a beautiful model of a war ship hanging in the nave. It was constructed by the Dutch for the Russian Tsar, but apparently got lost in a storm on the voyage to Saint Petersburg and ended up on a beach in Northern Denmark. And thus, to Aarhus. On a more secular note, Aarhus also had a pedestrianized mall just around the corner, full of great shopping, if that’s your tonic of choice, intersected by a canal lined with copious restaurants, including, rather ambiguously, an Australian Bar. We wandered down cobbled lanes, past half-timbered houses to the harbour, where a huge open air screen had been erected for the Soccer World Cup inn a modern plaza full of wooden benches and an artificial lawn. Mobile food and drink stalls (Mad og Drikke), were in place selling hot dogs and beers, while the plaza teemed with youth and young families, making themselves comfortable on the Astro Turf and the wooden seating. We stayed for a while to watch Columbia beat Poland with colourful enthusiasm. There had been a city marathon in Aarhus the morning we arrived, so we had to dodge barricades, bunting and copious apple cores to reach the city’s spectacular modern art gallery. 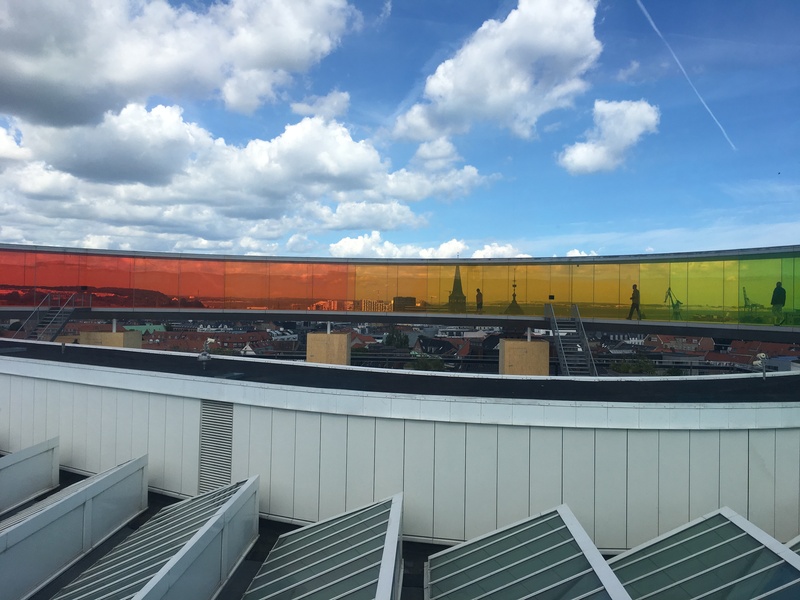 The ARoS art museum is topped with a circular platform rimmed in coloured glass, providing a kaleidoscopic panorama of the city. From here we could see the sea, and several elegant bronze spires. Opposite the museum, an early 20th century building – originally the state library – sported a row of owls along the eaves, symbolizing wisdom and erudition. Hogwarts comes to Denmark? One exhibition, ‘No Man is an Island,’ was fascinating, if somewhat challenging. It opened with the words of Salman Rushdie: A poet’s work is to name the unnameable, to point at frauds, to take sides, start arguments, shape the world, and stop it going to sleep. Representing national and international artists, the exhibition included Australian, Tracey Moffatt, with her emotive film ‘Revolution,’ a pastiche of black and white movies about political upheaval that she created in 2008. It is a subtle dig at humanity and its seeming inability to change or learn from the mistakes of its predecessors. Later, looking for a snack, we came across the Aarhus Street Food arket near the bus station. On this warm Sunday afternoon, it was full of young families sitting in the sun, cheerfully munching on Vietnamese bahn-mis, Mexican tacos or licking some sophisticated and scrumdiddlyumptious ice-creams. The One and Only opted for a local beer, while I found a dark, Languedoc rosé to accompany my Ugandan salad. By 9pm we were hungry again, so we drifted down to the canal where we found a terrific little tapas bar and nibbled on some delectable salmon ceviche and octopus carpaccio beside the water. The next morning, we wandered out for coffee and ended up walking across town to ‘Den Gamle By,’ an open-air ‘living’ museum. 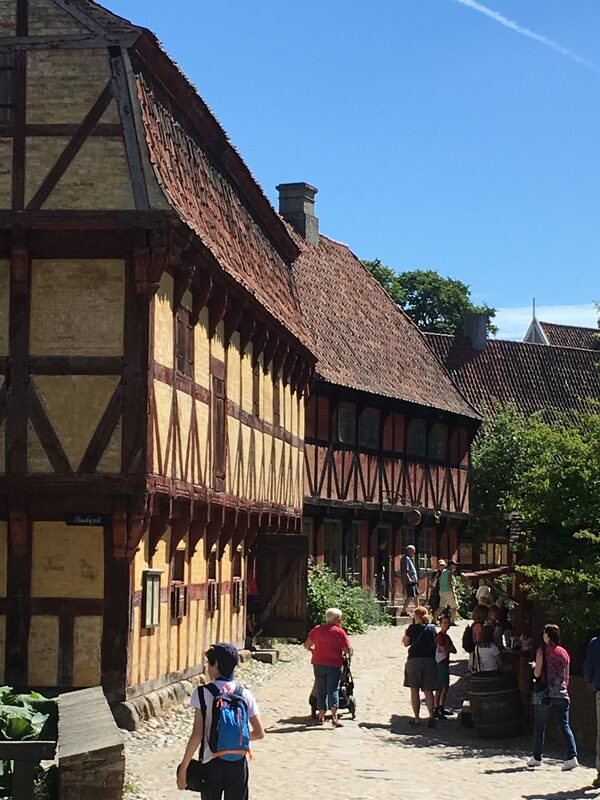 Here old, timber houses from all over Denmark, dating as far back as the sixteenth century, have been rebuilt to create a town that takes you travelling through time. Heavily cobbled streets weave past shops and houses with tiny front doors through which even I had to duck. Here, we came across characters dressed in period costume who were happy to explain how people lived and worked in the olden days. Others stayed in character and talked as if you were neighbours from a bygone age. There was a watchmaker, a milliner, a shoemaker and an apothecary, a tailor, a miller, a goldsmith a the book binder, a brewer, a baker and a coffin maker, all displaying their wares. Above the watchmakers, there was a clock museum: stately and intricately designed grandfather clocks; modern watches, and a 1970s travel clock just like one I was given for my 10th birthday. We visited the alms houses at one end of the town and the mayor’s rather grander establishment at the other. An old man snored from his truckle bed in a one roomed workman’s cottage and the apothecary’s garden was blooming with an assortment of medicinal plants and flowers. A horse drawn cart clattered through town bearing a handful of excited kids and we even tried our hand at bowling down wooden skittles in the local fairground. Eventually, we passed from medieval to more modern times, as cars and electricity began to change the streetscape. And towards the end we found a display of elegant evening gowns worn by Denmark’s Queen Margarethe for significant events over the past fifty years. 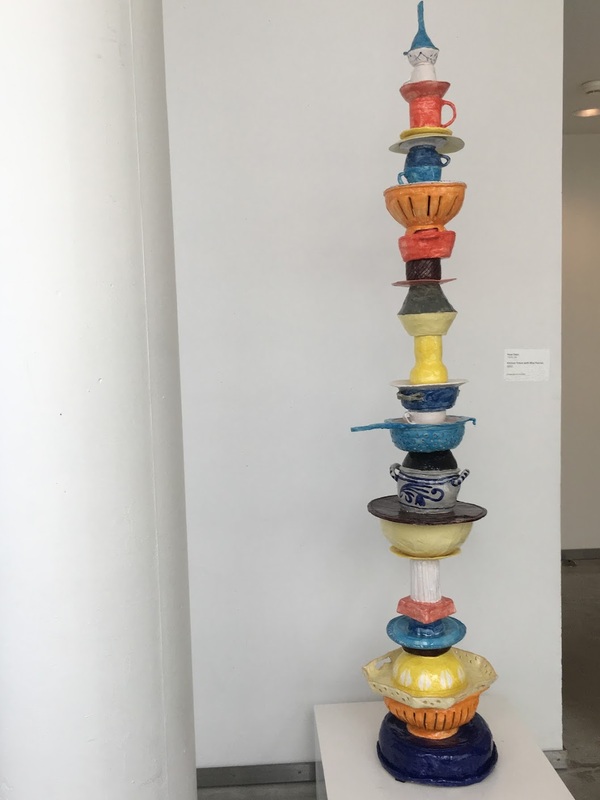 This entry was posted in Denmark, Food & Wine, History, Local Culture, Travel and tagged Aarhus, ARoS art museum, Den Gamle By, Denmark, No Man is an Island, Salman Rushdie, Street Food Market, Tracey Moffatt. Bookmark the permalink.